As you develop your strategy to enable employees to work remotely on their own devices (BYOD), you need to make key decisions in the scenarios to enable BYOD and how to protect your corporate data. Fortunately, EMS offers all of the capabilities you need in a comprehensive set of solutions. In this topic, we examine the simple use case of enabling BYOD access to corporate email. We’ll focus on whether or not you need to manage the entire device or just the applications, both of which are completely valid choices. WiFi/VPN – If your users need a corporate connectivity profile to be productive, this can be seamlessly configured. Applications – If your users need a set of apps to be pushed to their device, these can be seamlessly delivered. This includes applications that you might require for security purposes, like a Mobile Threat Defense app. Compliance – Some organizations need to comply with regulatory or other policies that call out specific MDM controls. For example, you need MDM to encrypt the entire device or to produce a report of all apps on the device. User experience – MDM enrollment includes many warning prompts (enforced by the platform) that often result in the user deciding they would rather not access their email on their personal device after all. MAM is much less alarming to users, as they simply get a pop-up one time to let them know MAM protections are in place. Compliance – Some organizations need to comply with policies that require less management capabilities on personal devices. For example, MAM is only able to remove corporate data from the apps, as opposed to MDM which is able to remove all data from the device. 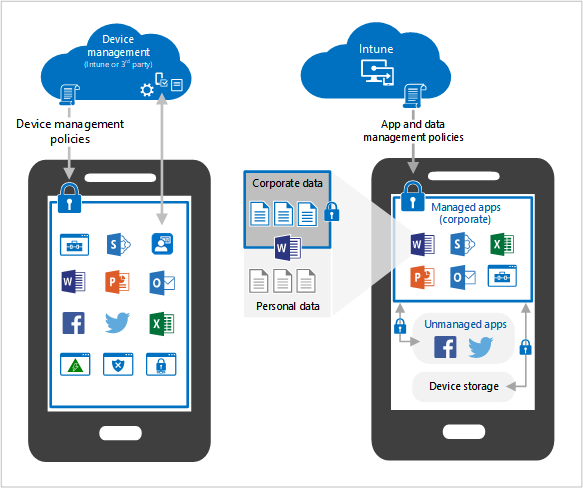 Learn more about device management and app management lifecycles. Still, many organizations often have specific risks they’re concerned about. The table below lists the common concerns and MDM vs MAM response to that concern. Now it’s time to decide if you are going to enable BYOD in your organization by focusing on device management, app management, or a combination of the two. The implementation choice is yours, where you can rest assured that the identity and security features available with Azure AD will be available regardless. Use the Intune Planning Guide to map out your next level of planning.